ADJ is pleased to announce the expansion of its range of DMX control solutions with the introduction of the mydmx GO tablet-based system. Designed for use by mobile entertainers and for installation in bars, leisure venues and small nightclubs, this revolutionary new lighting control system is extremely powerful but also incredibly easy to use. 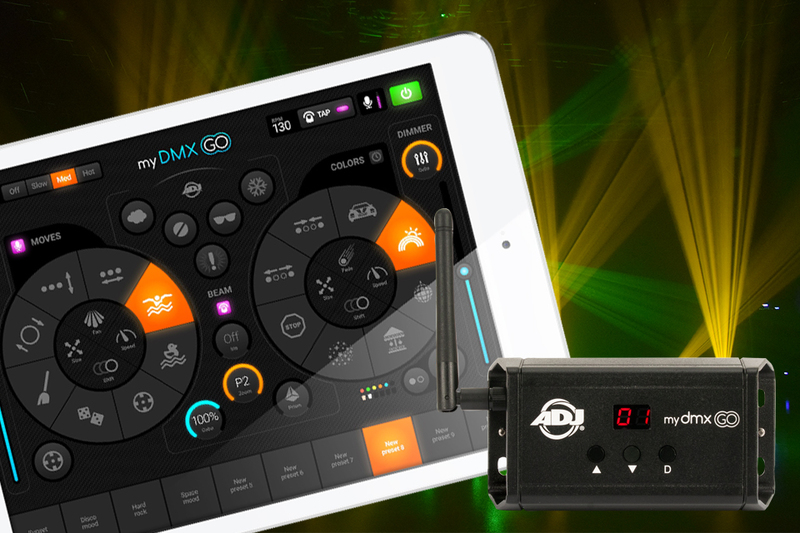 ADJ’s mydmx GO combines a uniquely intuitive app-based control surface with a compact interface that connects wirelessly to an Apple, Android or Amazon Fire tablet and provides a standard 3-pin XLR output for connection to a lighting system. Thanks to its ground-breaking design, the mydmx GO app requires absolutely no programming but can be used to create stunning synchronized lightshows across any combination of DMX compatible lighting fixtures. The app is supplied pre-programmed with a wide variety of easily customizable effects which can be used on any type of fixture. It features a distinctive layout that is built around two FX wheels – one for color chases and one for movement patterns – which each contain eight effect options. These can be selected independently, customized (by altering the color palette, speed, size, shift and fan) and combined to create a vast number of different unique effects which can then be stored for instant recall to one of 50 user-defined presets. In a ddition to the main FX wheel controls, dedicated buttons are also included within the interface for GOBO, Iris, Zoom and Prism. This allows the software to be used to control even professional-caliber moving head fixtures with advanced feature-sets. There are also five ‘flash effect’ buttons that can be used to easily add impact when the music reaches a breakdown or climax. These are: WOW! (creates a build-up of strobing effects synchronized with the BPM), Blinder (directs all lights forward and switches them to white), Freeze (pauses the current movement / color effect), Smoke (triggers a DMX-compatible fog machine) and Blackout. A simple-to-use color wheel interface makes selecting specific hues extremely easy when working with fixtures that offer LED color mixing and a dedicated Strobe button with speed control is also included. A Master Dimmer fader has also been integrated into the main control interface, while Sub Masters for each individual fixture can be easily accessed through a pop-up panel. The mydmx GO app is designed for mobile entertainers and venue owners who don’t have time to spend hours creating custom scenes and chase patterns but still want to achieve stunning synchronized lightshows. The software’s designers have created a new style of interface from the ground up – taking inspiration from game controllers, DJ music software and synthesizer keyboards – to create an app that is visually intuitive and therefore ideal for users who don’t have any previous DMX experience. In a matter of seconds, incredible lighting displays can be easily created that would require hours of programming using traditional control systems. With an extensive fixture library of 15,000+ profiles, the mydmx GO can be used to control all types of DMX lighting from any manufacturer, including moving heads, mirror scanners and LED pars. It features an extremely straightforward setup interface that makes it very easy to configure the app to control a specific rig. The software will then instruct users how to address each of their fixtures so that they receive the correct control instructions. The advanced app even allows the movement range of individual fixtures to be individually limited, which means that – for example – moving heads positioned on podiums at the front of a room can be set to only project forwards towards the dancefloor. As standard, the mydmx GO system can be used to control up to 256 DMX channels. 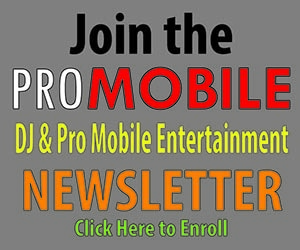 However, the software can be upgraded to offer up to an additional 256 channels. The hardware interface can also be used with ADJ’s myDMX 3.0 software (sold separately) and features two DMX outputs allowing for the use of up to 1,024 DMX channels: two full universes (the mydmx Go app only supports a single universe). The mydmx GO hardware interface is extremely compact and offers both permanent and temporary mounting options. It features a variable-angle antennae, for reliable wireless connection, as well as standard 3-pin XLR output sockets. It is also equipped with a 2-digit LED display and three corresponding selection push buttons that can be used to easily setup its connection to the app. The mydmx GO app for Apple, Android and Amazon Fire tablets is available now for free, while the mydmx GO interface is already available from ADJ dealers in the USA and will soon arrive in other territories around the world.